The ocean has many remarkable benefits to our ecosystems and society, one of which is it’s rehabilitative effect on individuals suffering from physical or psychological hardships, such as Post Traumatic Stress Disorder. The upcoming documentary Resurface features the story about United States Marine Corps infantryman Bobby Lane who, while on tour in Iraq, suffered two traumatic brain injuries when his troop was hit by five roadside bombs within an 11 day span. 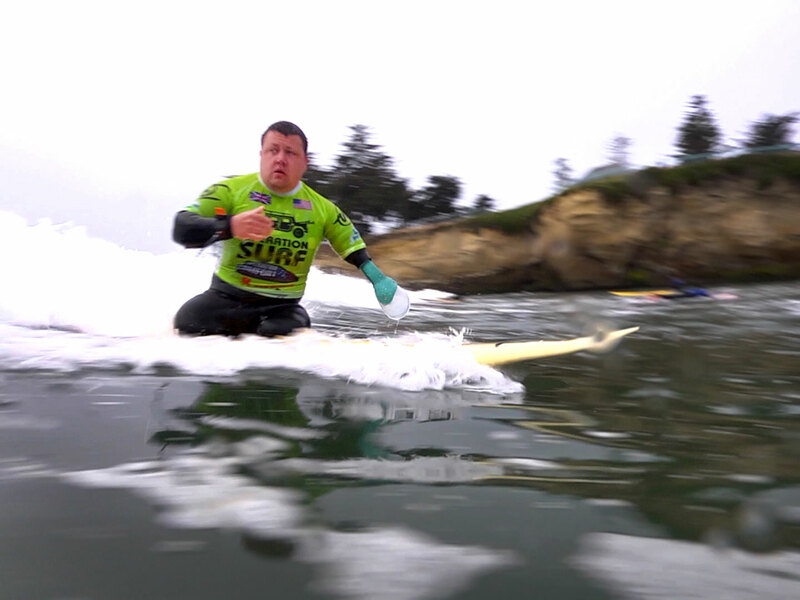 After returning home where he suffered many sleepless nights along with thoughts of suicide, Lane traveled from Texas to California to learn how to surf–his final bucket list item. Now Lane credits surfing with saving his life by helping him cope with his post-combat struggles. Resurface showcases candid video footage and extensive research about water’s effect on the human brain. 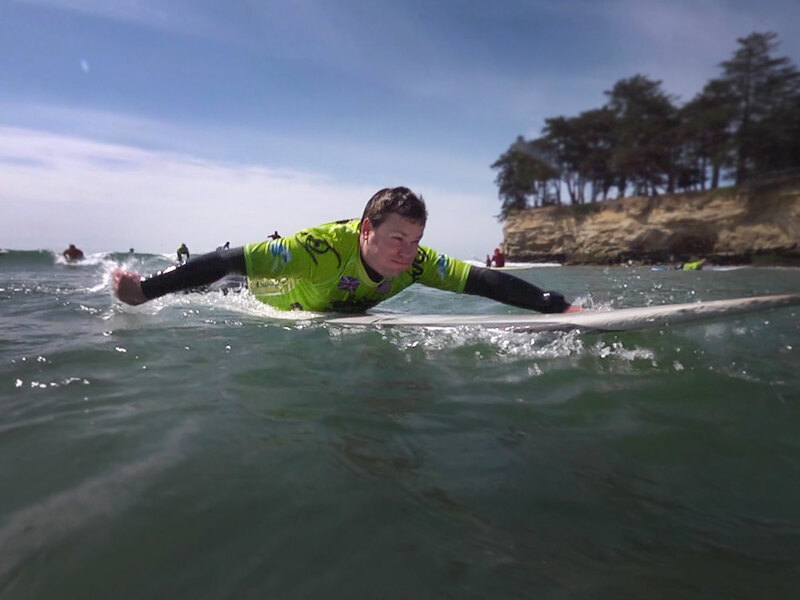 The documentary highlights the therapeutic outcome of surfing through the support of organizations who are dedicated to serving United States veterans. There is an innate reason why the act of surfing puts people in such a good mood! Based out of the San Francisco Bay area, Resurface Director Josh Izenberg and Producer Scott Stillman CONFESS their insight on the film’s aspirations and message. Read on! What are Resurface’s’ main goals? Josh: First and foremost to make a great film and tell a great story, as a filmmaker. We want to raise awareness around the powers of surf, movement and being out in the world in general, as a therapeutic way to heal. 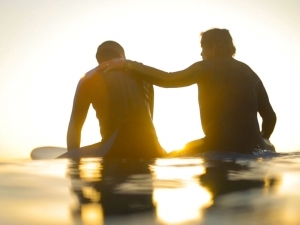 Scott: From a personal standpoint, I just started surfing a few years ago and felt a new level of peace and connectedness. It was amazing to feel that and to then discover that there are actually people out there who teach surfing as a way to rehabilitate PTSD, depression and traumatic brain injuries. I wanted to be involved in raising awareness for that issue because I really do think there are therapeutic benefits to being in and around the water. What was the most helpful resource for your film? Josh: I think the biggest resources, by far, have been the Jimmy Miller Memorial Foundation and Operation Surf. This is huge. If we just said ‘hey let’s show up with our cameras and you guys do your thing,’ it would not have been enough. Scott: We also interviewed Dr. Wallace J.Nichols, Marine Biologist. He wrote the New York Times’ best seller Blue Mind, which has really been the anthology of the most recent research and studies about the benefits of water and people. He was pretty insightful in his interview and his book was a helpful resource, too. He is providing the academic research side to this project. The science and the data are actually backing up what we feel. What were some of the obstacles that you overcame while working on this piece? Josh: The waves are unpredictable. It’s tough to shoot in the water, even when the waves are perfect in addition to making trips to southern California. We are totally dependent on good surf. Sometimes the waves weren’t always doing what we wanted them to do. It’s tricky but we made it work. Scott: We really hope we can get the Kickstarter funds to finish this film because we want to get it out there. I think it’s going to be really powerful to accomplish the goals that Josh went over earlier. What can the viewer do to make a difference? Josh: We want to get the word out about the film and the campaign, so contribute to the Kickstarter campaign and also share it among like-minded folks who would be interested in participating. Scott: I would love to screen the film at different organizations that work with veterans and also even take it to the Veterans Affairs hospitals and set up screenings there. I think it comes down to a knowledge gap where people don’t even know that organizations like Jimmy Miller and Operation Surf are out there. The more we can speak to the community who are in touch with veterans, the more likely they become involved with programs like these. Even in the middle of the country, where there is no access to the ocean, there are organizations that work with veterans going kayaking or fly fishing on the water. Even if it’s not surfing, just being around the water is helpful. Resurface is expected to release Fall 2015. Please donate to the Resurface Kickstarter Campaign and support this film’s production and message!